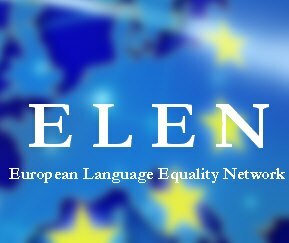 The European Language Equality Network (ELEN) is Europe’s only international civil society organisation dedicated to the protection and promotion of regional, minority, and endan-gered languages (RMLs). To date it represents 44 language groups in 20 European states. Examples of member organisations are language immersion schools such as the award win-ning Diwan Breton medium schools organisation in Brittany, single language organisations such as the Karelian Language Society (Karelia) and Kowethas An Yeth Kernewek (Cornwall), umbrella organisations such as Kevre Breizh (Brittany), Kontseilua (Basque Country), Mudi-adau Dathlu’r Gymru (Wales), the Estonian Bureau for Lesser Used Languages, and large cultural organisations such as Accio Cultural Pais Valencia (Valencia), and Plataforma per la Llengua and Omnium Cultural (Catalonia), Conradh na Gaeilge (Ireland), Commun na Gaidhlig (Scotland), and A Mesa pola Normalización Lingüística (Galicia), university depart-ments such as SOMU at the University of Mainz (Germany), and research institutes such as the Consiglio Nazionale delle Ricerche (Italy). ELEN, through its membership, works to represents the 55 million people, 10% of the EU’s population, who speak a regional, minority or endangered language. ELEN conducts its ad-vocacy work with the European and international institutions: the European Parliament, European Commission, United Nations, Council of Europe, and the OSCE, as well as at the State, national or regional, and local level. The other pillar of ELEN’s work is on EU funded language projects with our members, for example, the Digital Language Diversity Project funded by the EU Erasmus Plus programme. Visit our website and join us on Facebook!